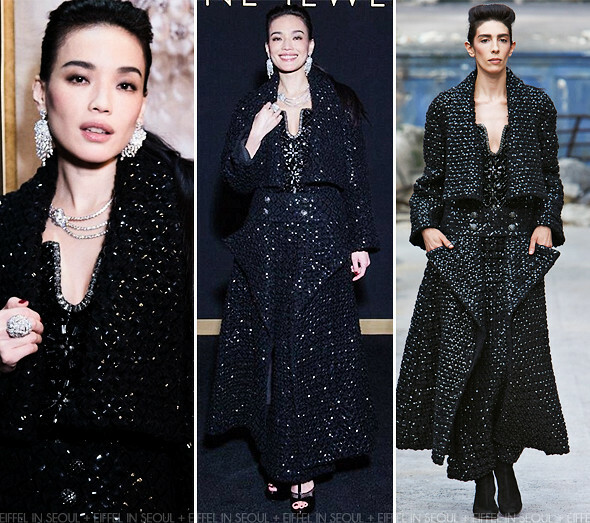 Taiwanese actress, Shu Qi (舒淇) attended the jewelry exhibition of Chanel latest collection, 'Sous le Signe du Lion' held in Beijing, China on January 16, 2014. The actress was dress head to toe in a heavily embellished ensemble from Chanel Fall 2013 Haute Couture collection while draped in impressive jewels from Chanel 'Lion Venitien' set. I would have loved to see her outfit without the heavy coat; it was probably a little too much for an exhibition opening. What do you think? Choi Ji Woo hands down. She looked chic and studious. The dress is flamboyant and eye-catching; I like that. On Zhang Ziyi, it would have been better if the dress was knee length. Ugh, I just can't even. She looks too fab! And the Jimmy's mesh well with the outfit. Love.